My mom taught us to conserve electricity, water, and recycle. We took bags of cans to the recycling station near our house and made a little money for our efforts. We didn’t have a central air conditioner in our home. While it made the summers a bit warm, we didn’t know the difference. We got by with fans, open windows, and an attic fan at night. Once I moved out, I fell accustomed to central air and realized while open windows and doors are my favorite, air conditioning has its place on a sweltering Missouri day. I try to keep it at a manageable level. Manageable to me means something very different to my husband. 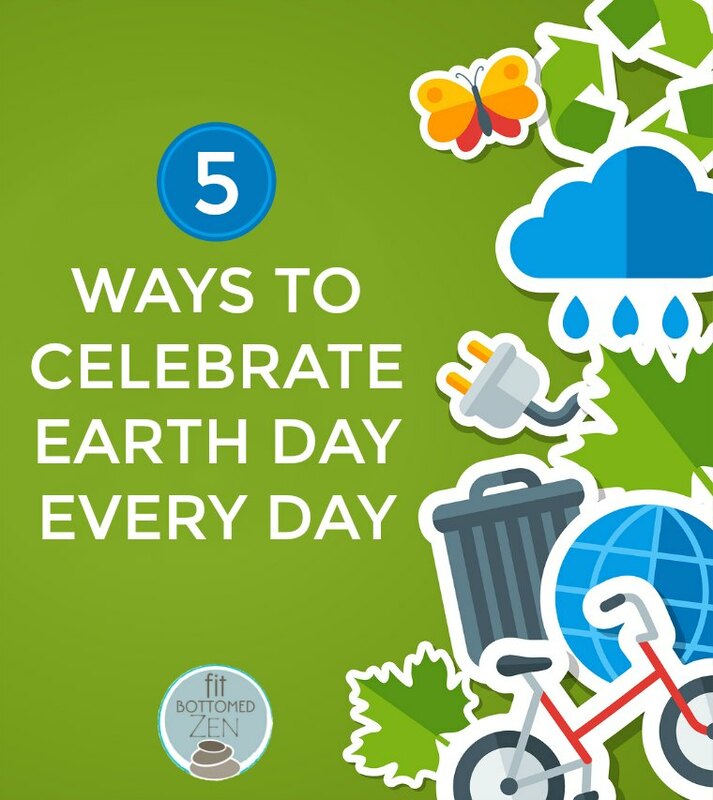 With Earth Day quickly approaching on April 22, here are several small, easy things you can do in your home to celebrate Earth Day that can have a huge impact every day — whether or not you’re okay to ditch the AC. I’m trying to be more mindful about making sure I only buy what I know I’ll be able to eat before it goes bad. I’m sure most of us have had to throw something out at some point because your week ended up crazier than you planned and you just didn’t have time or energy to make that amazing roast, right? But we can make our best effort to stop wasting food. If I end up with leftover bread or my apples start turning a little sooner than I’d like, I toss it outside. My neighborhood is full of wildlife and they love benefiting from my mistake. You can also throw scraps into a composter and end up with fresh compost for your garden. When life hands you black bananas, make banana bread. I’m the person that runs around my house turning off lights. I’ve gotten more than a few eye rolls from my husband, but hello, it’s for the Earth! I’m also a lover of natural light. If I’m home during the day, you’re likely to find me with the shades fully open, letting in that natural light. Keep your air conditioner a few degrees warmer and your heater a few degrees cooler (time for that blanket) to significantly impact the environment and your heating/cooling bill. Another easy trick is to turn down the temperature on your water heater. Yes, your water won’t be quite as hot but neither will the Earth. Take shorter showers. Get in, take care of business, and get out. I only wash my hair every other day, but I know that’s not something every hair type can handle. Make sure your toilet isn’t letting out a slow leak, try to only run full loads in the washer and dishwasher, and turn off the water when brushing your teeth. Who doesn’t remember this commercial from their childhood? I love planting flowers outside. I’m also an indoor plant mama. I think I’m out of space, but always seem to make room for a new one! Many varieties are good at improving the atmosphere, the air quality and feng shui. My husband and I also took time to plant a tree in our backyard on Earth Day a few years ago. Take time to research what trees grow well in your zone and how large they will become. Be mindful of fences, power lines, and underground pipes/lines. I’m lucky to live in a city where recycling is a priority. We have a bucket that we can fill with anything other than glass and set out each week. My pile is usually overflowing. We also have a bucket for glass, but we take it to a collection site. Even if your city doesn’t have recycling pick-up, you can recycle. The Earth literally can’t sustain our population as it stands. Earth Overshoot Day was on Aug. 2 last year. That’s the date each year when we’ve used up all of our natural resources. Anything beyond that date is borrowing from resources we don’t have. There are so many more things we can do, but these simple changes at home can make a big difference.